A Rube Goldberg machine, for the uninitiated, is a device designed to accomplish a simple task in as many unnecessary, ludicrous steps as possible. 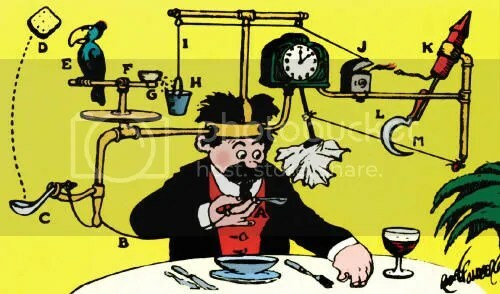 The name comes, appropriately enough, from Rube Goldberg, a cartoonist and inventor most famous for his cartoons featuring singularly silly and elaborate machines like the one pictured below. But it turns out that an old friend of the blog — domino master Lily Hevesh, aka Hevesh5 — is now venturing into the world of Rube Goldberg machines. And her first attempt was a doozy. Teaming up with five machine-building YouTubers — essentially, videomakers who specialize in chain-reaction mechanical devices — Lily and the group descended upon an AirBnB in San Diego to build a Rube Goldberg machine that would span the entire house! The Lemonade Machine, as they call it, travels from room to room, utilizing items commonly found in those rooms (silverware and a teapot in the kitchen, for instance) to construct an epic-length chain reaction with everyday household objects. The end goal? Pouring a glass of lemonade for each member of the build team. So, how did they do? They constructed a real mechanical marvel here. It took three days to build, and another day to execute a complete successful run of all of the machine’s components in a single take. The end result was the largest Rube Goldberg device constructed in the United States this year. Not only that, but Lily documented the entire process, so you can watch both the construction and the many MANY attempts on Falldown Day to achieve a successful run of The Lemonade Machine. It’s a mind-blowing feat, combining puzzly skill, creativity, patience, and determination, and there’s no denying that they built something truly unique and pretty cool. I’m gonna go watch it again.